The groundbreaking book Believing Christ by Stephen Robinson has become a standard in understanding what it means to have faith in Jesus Christ and to be justified by faith in Him through the gospel covenant. 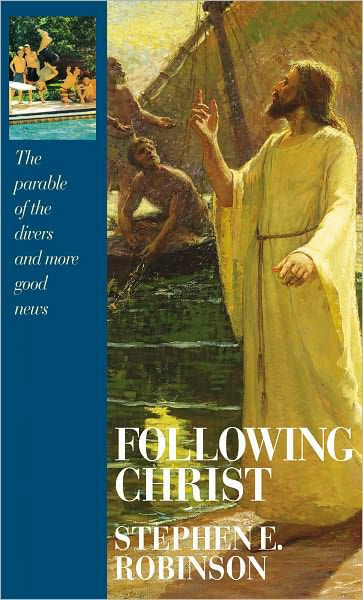 Now, in Following Christ: The Parable of the Divers and More Good News, Brother Robinson explains what happens after we have entered the gospel covenant. He writes, "Where Believing Christ dealt with entering the covenant, this book will focus on staying in the covenant. If being truly converted is to accept Christ as Lord and to make Him the Lord of our lives, then this must somehow be reflected in our lives -- but how? How does being born again translate into behavior after our conversion?" In the same clear, readable style of his first book, Brother Robinson explains what is means to be a member of Christ's kingdom, the relationship between faith and works, what it means to endure to the end (it does not mean "being perfect"), the nature of mortality, hazards we may encounter as we seek to endure in the Lord's service, and, finally, the importance of serving others in love.